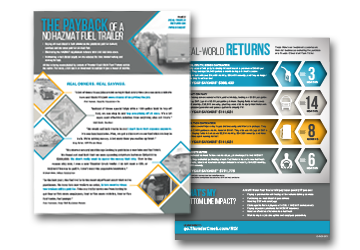 In addition to legally hauling bulk diesel without a HAZMAT, a Multi-Tank Trailer lowers input costs, reduces labor and operating expenses, and improves efficiency on site. The savings can be enough to realize a full return on investment in a matter of months. YOU DON'T WANT TO MISS PAGE 2. A water, utility and sewer contractor using a third party to fill machines on site. A freight company looking eliminate the need for a wet-hosing service. A demolition contractor making several trips a day to gas stations. A fuel distributor comparing the cost of a new fuel truck to a pickup and fuel trailer.